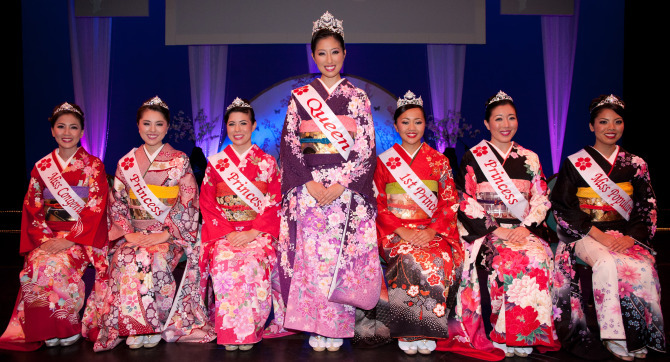 Left to right: Miss Congeniality Heather Smith, Princess Tomomi Ida, Princess Nicole Kinney, Queen Erin Morimoto, First Princess Edrea Katsunuma, Princess Cari Tasoe, and Miss Popularity Teri Nakakura. Photos courtesty of Steven Yamaki, photographer and owner of Images by Steven, a Silver Sponsor. Attire provided by Tori Richard, a Gold Sponsor.